Taylored Expressions December Sneak Peeks: Love is an Adventure and Heart of Hearts! Hello! It's Day 2 of Sneak Peeks from Taylored Expressions and all of the new products will be available on Thursday, December 10th at 7AM PST! For my first card today, I used a fun new Valentine set called Love is an Adventure! I stamped two of the images from the set with Memento Tuxedo Black and paper pieced the hearts. I cut the images out with the coordinating Love is an Adventure Dies and set them aside. I put my scene together using the Build a Scene Rolling Hills Dies and the Build a Scene Paper Pack, along with a Build a Scene Rolling Clouds Die. The background was embossed with the Cloudy Days Embossing Folder. I popped my images up with foam tape and stamped the sentiment directly onto the clouds. Super cute! 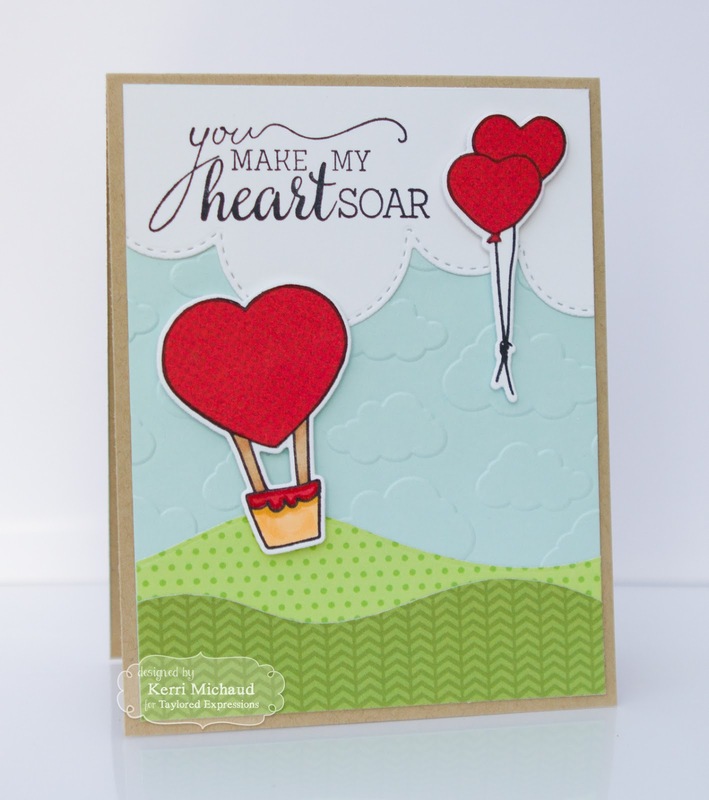 For my next project, I used the sweet new Heart of Hearts Stamp and Die Combo. This set comes with several fun heart images and Valentine sentiments. I stamped the large heart image with Memento Tuxedo Black, colored with Copics, and cut it out with the new Stitched Heart Stacklets. I stamped the smaller heart with a light blue ink and then cut it out with the included heart die. The sentiment was stamped onto a banner cut with the included banner die. I embossed the red layer with the new Swiss Hearts Embossing Folder and layered that over some My Mind's Eye Cupid's Arrow dp. I love how this came out!